distribution Extreme southeastern corner of the state (Bladen and Brunswick counties only); disjunct from the main part of the range in FL and extreme southern GA. Surprisingly, not yet known from SC. abundance Presumed to be very rare and local in NC, but numerous at one or more sites in Bladen County. Dunkle (2000) calls it "common" in FL, but the fact that the species hasn't been found in SC or most of GA suggests that it must be quite scarce in NC. flight Spring to very early summer. NC dates fall between mid-April and mid-June. habitat Sand-bottomed lakes. Individuals are often seen along the shoreline of a natural lake, perching on the sand. One seen in May 2015, however, was over a mile from the nearest lake and perched on the ground along a roadside. 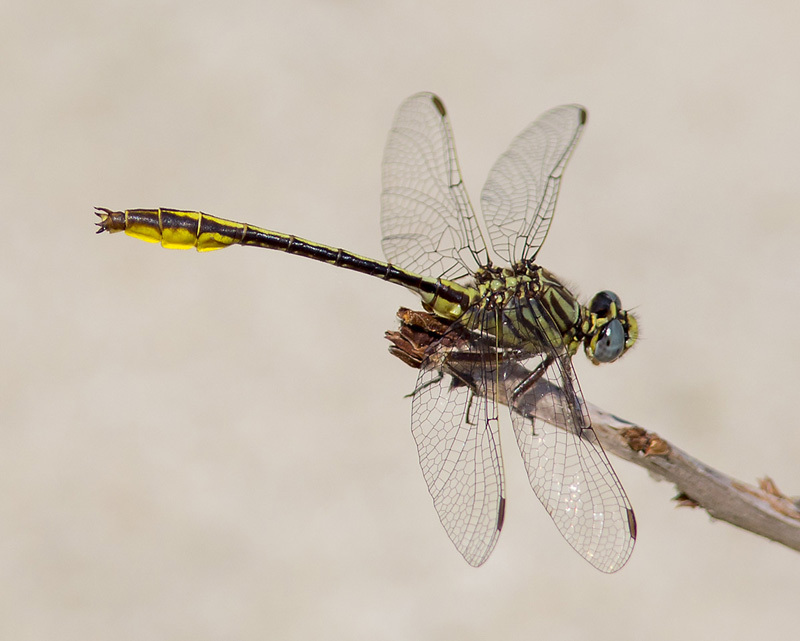 behavior Males perch on the ground or in vegetation near lakes. comments The subspecies in NC is Phanogomphus cavillaris brimleyi. This subspecies is also found in the panhandle of Florida; the nominate subspecies (P. c. cavillaris) is found throughout the FL peninsula. Ed Corey saw and photographed several individuals on 3-4 June 2008 at bay lakes in Bladen County, to confirm that the species still has a presence in NC. Eighteen additional records were made between 2009 and 2018, all in the same areas in Bladen County as previously known. Comment: Bladen, 2017-04-17, Jones Lake State Park (JONE). - Females. Recently emerged; on the fishing pier.